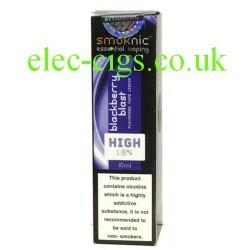 Blackberry Blast E-Liquid by Smoknic: Hold on tight as you inhale this Blackberry flavoured E-liquid. Berries upon Berries make this ultra refreshing with and its added blast of Icy cool Menthol is sure to cool you down and leave your mouth feeling super charged. Blackberry Blast E-Liquid by Smoknic is available in a 10ml bottle and comes in a choice of 3 nicotine strengths, which are: 6 mg (0.6%), 11 mg (1.1%) or 18 mg (1.8%). Enjoy the best value premium e-liquid available anywhere, which can only be purchased in multiples of 10 bottles. 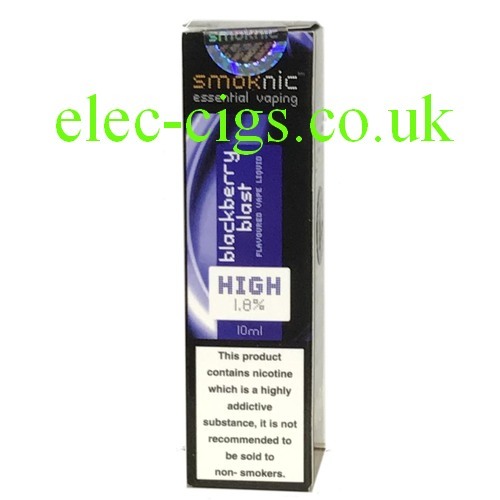 Blackberry Blast E-Liquid by Smoknic: Minimum quantity is 10 bottles. This e-liquid can only be purchased by persons aged 18 years or older. This product contains nicotine which is a highly addictive substance.